Remember this recurring nightmare? You’re suddenly back in high school, you realize it’s finals day, and you not only haven’t studied, you haven’t even been to class all year. That’s the same kind of cold sweat IT and web managers wake up with when they imagine having failed to renew an important domain name. And that’s the fear that domain name scammers play on when they target small business owners. For professional IT managers, long experience managing domain names tempers paranoia, but doesn’t entirely relieve it. They know by experience, for example, that even domain names set to auto renew at a registrar can fail to do so due to technical glitches, billing credit cards expire, etc. For small business owners who are managing their own web sites, the anxiety can be greater because they may only deal with their domain name once a year or every couple of years. For those folks, recalling, the difference between a “registrar” and a “web host” is simply not top of mind. And that makes them targets for scammers who want to play on their fear of losing a domain name. One technique of scammers (even some fairly large and otherwise legitimate companies) is slamming. This involves sending an domain name expiration notice to an unsuspecting business owner. The business owner clicks on the link to renew the domain and goes through the process. The problem? They’ve just transferred their domain to a different company, possibly months or even years before that domain was actually set to expire, and at a higher annual cost! Another way people get taken in is by misleading email messages. These have enough real information in them to provide the company sending them plausible deniability – but you really have to read the fine print. Here’s an example that one of our clients forwarded me the other day. This email suggests that the recipient had already been subscribed to this service (he hadn’t), and that if the service expires, he’ll be harder to find on the Internet (sheer hogwash). The language in the footer tells the real story, although some of these statement are also questionable. It’s dubious that the recipient opted in for this email as claimed. And the “this is not a bill or invoice” language in the footer is there, in very small type, specifically because this email was designed to suggest exactly that. For those of us who work in the industry and have spent decades dealing with domain registrars, SEO and the like, these emails may seem like obvious spam. 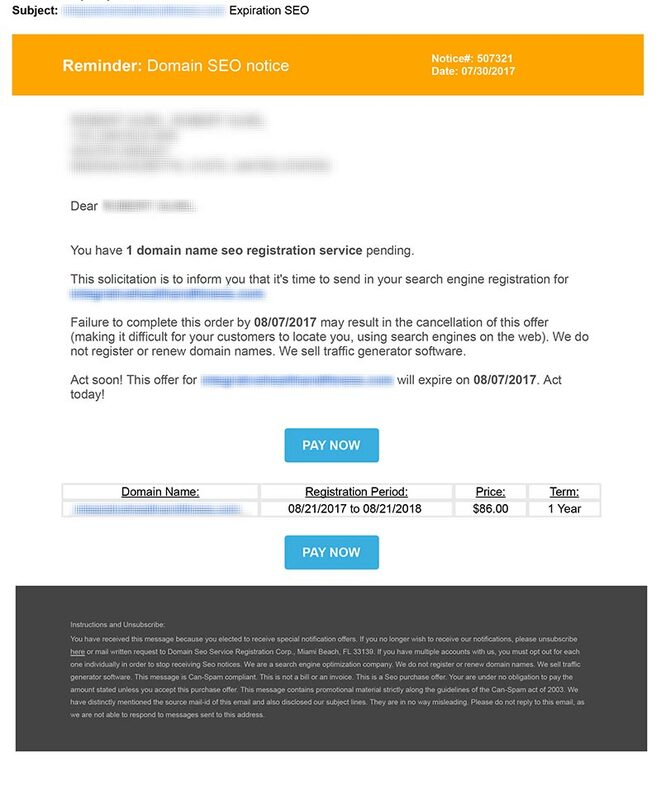 But for somebody who is focused on running another kind of business and hasn’t made domain name registrars an area of expertise, these emails have patina of legitimacy and urgency. This is exacerbated because the company sending the email seems to know some specific details about the domain name and the person who registered it. The rule of thumb online, really as regards everything you encounter, is skepticism. Here are two very simple ways to exercise this. If you get an email that doesn’t feel right, don’t click it. If it’s your bank telling you to reset your password, call your bank directly – don’t use the contact information from the email. 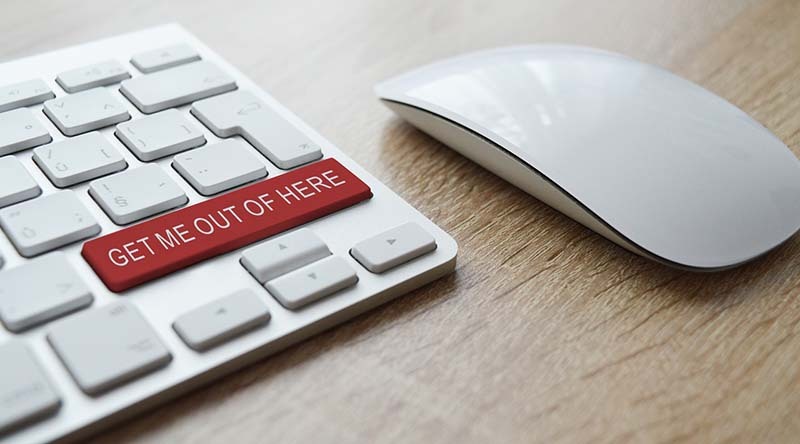 Taking a suspicious attitude toward email will not only prevent you from getting scammed, it’ll prevent you from picking up viruses and malware as well. Enter the language from the email into a search engine. If it’s a scam or fishing attack somebody will have likely written about it. On the web, and frankly, in life in general, healthy skepticism is a useful trait. Caveat emptor, quia ignorare non debuit quod jus alienum emit, my friends.